Do you have friends or family traveling to México? Not yet decided what to do? Follow Me Tours is willing to help you to plan your activities and destinations! Winter in Mexico is a great time to visit and you can find special offers in still hidden but incredible destinations. We can organize one-day trips to one-month trips. We know you can’t see it all, but we’ll do our best to make sure you visit the most interesting places with professional guides. Let us help you plan a trip to experience any or all of our top ten things and places this May upon request. Please contact us by Enquiry, Phone or a whatssapp and let us customize an unforgettable trip just for you! I just went with two out of town guests -Follow Me Tour two days ago to see the Monarchs. Fabulous trip! Very professional. Safe, fun, knowledgeable driver/guide. Reasonable prices -can use VIP card if you have one. Highly recommend. Went on a butterfly tour today with Follow Me Tours. FANTASTIC day ! The butterflies were magical and our guide, Aldo was terrific.. He was very knowledgable about the butterflies and as a bonus I learned a lot about mexico .Despite a long drive day(~8hrs) he made it very easy and comfortable . From the booking, to followup emails with details on what to bring and wear , all very professionally handled. I will definitely use this company again and have no hesitation recommending them to others for any trip or excursion around sma/ or the region . An added bonus was learning how the company owner , Emma Salazar is involved with various projects in the community – they are active donors of time and skills, more impact than just giving money .it feels good to support a solid business that is also doing good . We just returned from a wonderful trip to Mexico City with Follow Me Tours. Emma built us a special program — a combined night tour of Teotihuacan and a two-day city tour/orientation of CDMX. Aldo Ibarra was a fabulous guide — his knowledge of “things Mexican” is both wide-ranging and deep. He’s enthusiastic, insightful, articulate and good-humored, and an expert not only on Mexico’s rich history, but informed about food, baseball, art, politics and more! We learned how to use the subway and the metrobus systems and came home feeling inspired about return trips to the city and seeing other parts of Mexico as well. Thanks Emma and Aldo!! 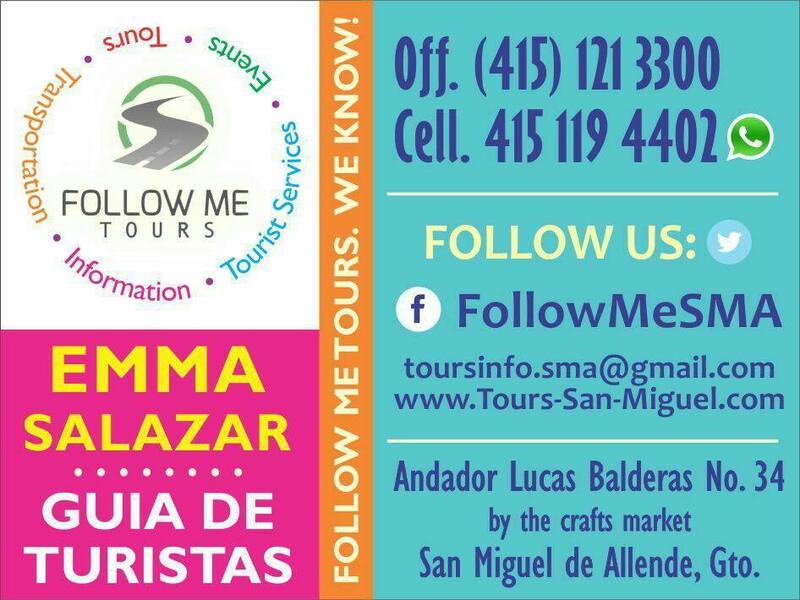 We arranged travel arrangements to Guanajuato and Hotel with Follow Me Tours. Alejandro was an excellent driver and the hotel is charming. We are very pleased.